Positive energy and positive actions help us improve our own lives, the lives of others and the world around us. The organization We Are What We Do's mantra is "Small Actions X A Lot of People = Big Change". 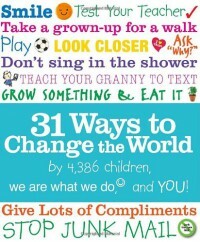 This book demonstrates 31 ways that any kid could influence positive change by doing small things. Examples include Teach Your Grandma to text, in order to help out older generations understand new technology and to spend time bonding with a family member. 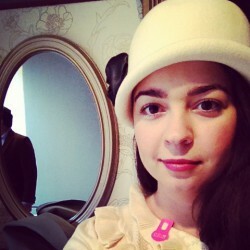 Or Don't Charge Your Cell Phone overnight to reduce the excess usage of electricity and help the environment. This is a simple and straightforward book with lots of bright and colorful spreads. It's very interactive and gets kids to not only think about positive actions but to actually do them.